New Delhi, India -- Vegetarian diets are always better than non vegetarian foods. Sticking to vegetables for five days a week can significantly reduce the body's amount of antibiotics and phthalates – a common chemical added to plastics. To come up with a conclusion, a group of researchers in Korea experimented on a group of people. The participants were asked to stay at a Buddhist temple for five days, where they could only eat a pure vegetarian diet. Before and after their stay, the participants were sent for urine tests. It was found that the level of the harmful chemical, phthalates dropped dramatically by the end of the experiment. It was also found that the amount of food each participant had was directly related to the amount of the chemicals found found in their urine. 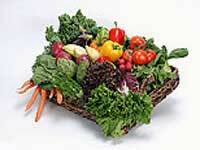 After a vegetarian diet, the participants had thoroughly detoxified their bodies and thus had a healthier diet. "A significant correlation was found between food consumption and the urinary levels of several antibiotics and phthalates," said a researcher. The short five day experiment suggested that even short-term changes in dietary behaviour can significantly decrease inadvertent exposure to antibiotics and phthalates and hence reduce oxidative stress levels.